Finally: AEI’s Wind Farm Noise 2011 is out! After long months of gestation, examination, and procrastination, this year’s Wind Farm Noise report is ready to share! So, here it is. It’s also viewable here on SlideShare. And, you can download the 55-page report, and much of the source material, on the new AEI Wind Farm Noise Resources page. Lemme know what you think of it! The past week has seen a flurry of new reports and articles that aim to debunk the idea that wind farm noise should be taken seriously as a concern when siting new wind farms. AEI’s upcoming Wind Farm Noise 2011 report will address the issue in great depth when it’s released in about a week, but for now I wanted to make a few comments about the recent releases. Two reports came from Canadian environmental groups that advocate expansion of wind energy and are frustrated by local resistance, especially in Ontario. I share their support for wind energy providing an increasing percentage of our electrical generating capacity, and have little problem with the bulk of these reports; but in each case, I feel that their treatment of noise issues misdirects attention away from the very real problem at the core of the debate: when wind turbines are built closer than a kilometer or so from homes in rural areas, a high proportion of those nearby neighbors experience significant quality of life impacts due to audible turbine noise. An article in Renewable Energy World this month provides a great overview of ongoing research funded by the DOE that is assessing environmental impacts of “Marine and Hydrokinetic” energy technologies. These new “MHK” systems include anything that generates electricity from the movement of water without dams, including systems that tap waves, tides, currents, or ocean thermal gradients. Much of the research looks at the ways these systems can change the physcial dyanamics of ocean ecosystems (e.g., reducing wave height by drawing energy from the waves, changes in sediment movement and salt/freshwater mixing, etc.). Of special interest here, of course, are the five studies (out of of 21 currently underway) that are looking at possible noise impacts. Two are looking at areas where tidal turbine systems are in use or planned (Cook Inlet in Alaska and Admiralty Inlet in Washington); the Alaska study is looking for signs that beluga abundance or behavior is altered near a tidal turbine, while the Washington study is assessing existing background ambient noise and the acoustic footprint of a new tidal turbine. Other studies are testing an acoustic deterrence system to see if it keeps migrating gray whales out of a proposed wave energy park and developing an acoustic detections system that could spot marine life around MHK installations. Looking at the bigger picture, several other DOE-funded efforts aim to integrate MHK planning and site choices into larger marine planning and conservation initiatives. Two of these are developing protocols and best practices for siting, taking into account environmental and navigational impacts, and another, being undertaken by the Pacific Northwest National Laboratory, is working to incorporate siting of MHK projects into NOAA’s marine spatial planning efforts (essentially, ocean zoning, designed to minimize conflicts between various uses of the ocean). Finally, the DOE is leading international efforts at the International Energy Agency to come up with international standards and shared knowledge banks on environmental effects of MHK installations, as well as mitigation practices. Check out the full article, replete with links and detailed charts of all the ongoing research! 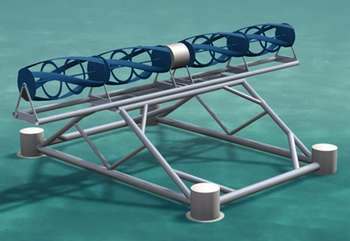 Note: The image above is a rendering of ORPC’s TidGen tidal and current turbine, which is being shown off this week at the EnergyOcean International Conference in Portland, Maine. Five environmental organizations have filed a legal petition asking NOAA to enforce speed limits in National Marine Sanctuaries off the California coast. If NOAA does not take action within a year, the groups say they may sue to under the Marine Mammal Protection Act. “Our marine sanctuaries should be a safe harbor for marine life, but instead whales in California are at constant risk of being run over by big ships,” said Miyoko Sakashita, oceans director at the Center for Biological Diversity. “Mandatory speed limits for ships traveling through our marine sanctuaries will save whales and clean our air.” Slower ship speeds also significantly reduce a ship’s noise, which could be a welcome relief in such a heavily trafficked area. In the past decade, nearly 50 large whales off California have been struck by ships. Last year, at least six were killed in collisions. A key factor in the decision about lowering ship speeds is likely to be whether the loss of less than ten whales a year warrants the change (more whales may be struck and sink without being seen). Along portions of the East Coast, federal authorities have imposed a 10-knot speed limit for ships 65 feet or longer for the past several years in order to protect the North Atlantic right whale, which is critically endangered, numbering only around 300 animals, so the loss of any individual is a blow to the population’s future. The groups are advocating a similar mandatory speed limit of 10 knots (about 11 mph) for all ships larger than 65 feet while sailing through California’s four national marine sanctuaries, which stretch from the Marin Headlands north of San Francisco, 300 miles down the coast to the Channel Islands north of Los Angeles. 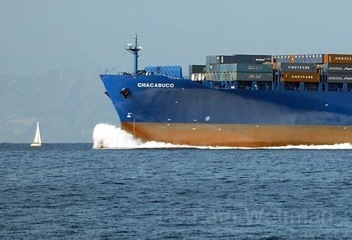 Ship speeds are now usually 13-25 knots. Since 2007, when four blue whales were struck by ships near the Channel Islands National Marine Sanctuary, NOAA has issued seasonal bulletins urging a 10 knot speed limit from May-December, when the blues are most numerous; environmental groups say most ships ignore this voluntary advisory, while shipping groups say most ships do adhere to it. A growing number of ships, along with rebounding populations of whales, and shifting krill populations, have increased the strikes, said biologist John Calambokidis, with Cascadia Research, in Olympia, Wash. Slowing ships would reduce injury when there are collisions, he said, but nobody knows for sure if it will reduce the number of collisions. One study cited in the petition noted that of 28 serious or lethal whale injuries evaluated, none occurred when the ship involved was traveling more slowly than 10 knots. You can look across a vast expanse of ice, all white and blue and cold, and see nothing. 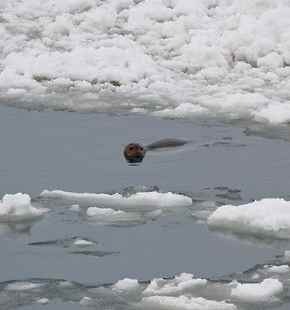 The lead is choked with pack ice or sealed over with newly formed ice, and there is no movement or sound. With few birds, no whales and no bears, one might mistake the Arctic for a desert. But if you go down to the ice edge, pick a hole in the new ice deep enough to reach water and drop in a hydrophone (an underwater microphone), the cacophony is astonishing. What I have come to enjoy just as much as listening is passing the headphones to someone who has never heard springtime in the Arctic. It is a rite of spring that would stun even Stravinsky. The low frequencies used by bowhead whales overlap the acoustic bandwidth in which large ships and oil and gas exploration produce sound. These manmade sources of noise are likely to increase background noise levels as summer sea ice continues to decline and shipping routes cross the Arctic during ice-free summers. It is possible that this increase in noise will affect bowhead whales in particular by causing them to change the frequencies they use to communicate or the duration of the calls they produce, or by restricting the ranges over which they communicate. This column was published recently in the Record-Patriot (Frankfort, Michigan). It offers a pretty solid short version of AEI’s current perspective on wind farm noise issues. A new research program at the University of Adelaide aims to learn more about the complex physical dynamics that create the primary noise in large wind turbines: the air turbulence off the trailing edges of the huge blades, which turn at speeds of up to a hundred miles per hour at their tips. “If we can understand this fundamental science, we can then look at ways of controlling the noise, through changing the shape of the rotor blades or using active control devices at the blade edges to disrupt the pattern of turbulence,” said research leader Dr Con Doolan. “Wind turbine noise is very directional. Someone living at the base might not have a problem but two kilometres away, it might be keeping them awake at night,” Dr Doolan said. “Likewise this broadband `hissing’ noise modulates up and down as the blades rotate and we think that’s what makes it so annoying. Further coverage is available from UPI. A recent article in the New York Times focuses on the financial benefits coming into communities in eastern Oregon, where wind energy development is booming despite state noise limits of 36dB at homes. Most wind farms in the US and Canada face noise limits in the 45-50dB range, with some regs going as low as 40dB at night; wind industry representatives generally claim that lower noise limits will preclude wind development. 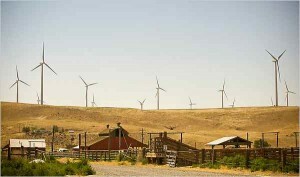 Oregon’s approach to wind farm siting, which imposes a cautionary noise limit to protect residents from unwanted noise, while allowing for easy exemptions when residents are willing to live closer to turbines, appears to AEI to be a constructive response that addresses concerns about protecting the rural soundscape while also encouraging wind development. In Sherman County, landowners earn $5500 per year per turbine, often hosting ten or more per landowner, often in wheat fields. The County earns enough in taxes and fees to keep schools flush with cash, and issue a modest annual check to all heads of household. While a 36dB noise limit aims to keep audible turbine noise close enough to existing quietest background ambient levels to be relatively unobtrusive, it should be noted that some residents report noise levels well above 36dB at times, suggesting that the noise modeling used in laying out the wind farms may have been faulty. Apparently, even with the lower noise limits, some homes are within a half mile of turbines, a range in which turbines are often easily audible and can sometimes cause sleep disruption. The state law allows companies to obtain waivers from residents in order to build closer and create to noise levels over 36dB, and some wind companies are seeking such waivers from nearby neighbors, in exchange for one-time or recurring payments. These waivers could also protect companies from situations in which actual noise levels rise slightly above the levels predicted by pre-construction noise models, as recently occurred at the Willow Creek Wind Farm in the same region. Well, having invested considerable time and effort in establishing a reputation as an honest broker of the science and policy debates surrounding various noise-related environmental issues (with DOE’s NEWEEP, NOAA, US Navy, Canadian DFO, and others affirming that by inviting my participation in public and private workshops and working groups), I was rather offended by his characterization. I quickly submitted a letter to the editor noting that AEI believes wind energy is an important part of our energy future, and that our focus on noise issues has from the start been focused on the idea that if impacts on nearby neighbors are not taken seriously, the future growth of the industry will be jeopardized. In several road trips over the past year, I’ve come across large wind farms in Texas, Iowa, Nebraska, and Wyoming, all of which were truly impressive and made a lot of sense on the landscape where they were. Nearly without exception, they were also miles from any homes. It’s only as we move wind farms into rural areas that are not primarily working landscapes that we’re finding a significant proportion of folks within a half mile or mile saying that their quality of life is being affected by the noise (which is, in my experience, nearly always clearly audible at a half mile, and barely audible at greater distances). Here’s my brief letter in defense of AEI’s balance, and here’s AEI’s initial critique that Colby refers to, which seems to me to be quite measured, and in fact supportive of much of what they found.